Last month, I signed up for a second-hand book swap that was being held by Lauren over at The Emerald Dove. I was paired up with Louisa from Duck In A Dress and today, the book arrived! It was a great thing to come home to after school. ^_^ Louisa was absolutely lovely and sent me a card and a few Green & Black's chocolates along with the book. Thank you! 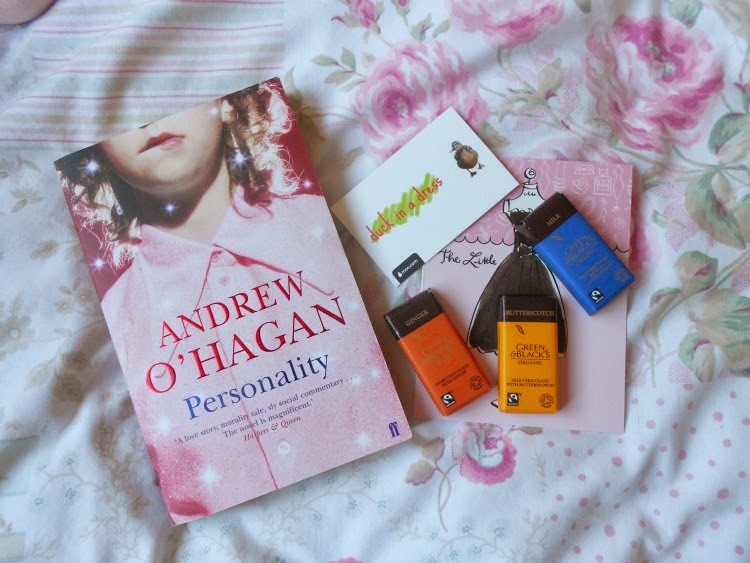 The book that Louisa picked out for me is Personality by Andrew O'Hagan. Growing up on the Scottish Isle of Bute, Maria Tambini is a young girl with dreams of escape from her Italian immigrant family. When her amazing singing voice wins her a talent show at the tender age of thirteen, she is whisked off to London and instant stardom. But even as Maria is celebrating her greatest success, she is waging a hidden battle against her own body, and becoming in the process a living exhibit in the modern drama of celebrity. Can she be saved by love? Or will she be consumed by an obsessive celebrity culture, family lies, and by her number-one fan? Personality sounds like something I'll really enjoy and I love that it's set in Bute. I can't wait to give it a shot! You can see Louisa's blog, Duck In A Dress, here.